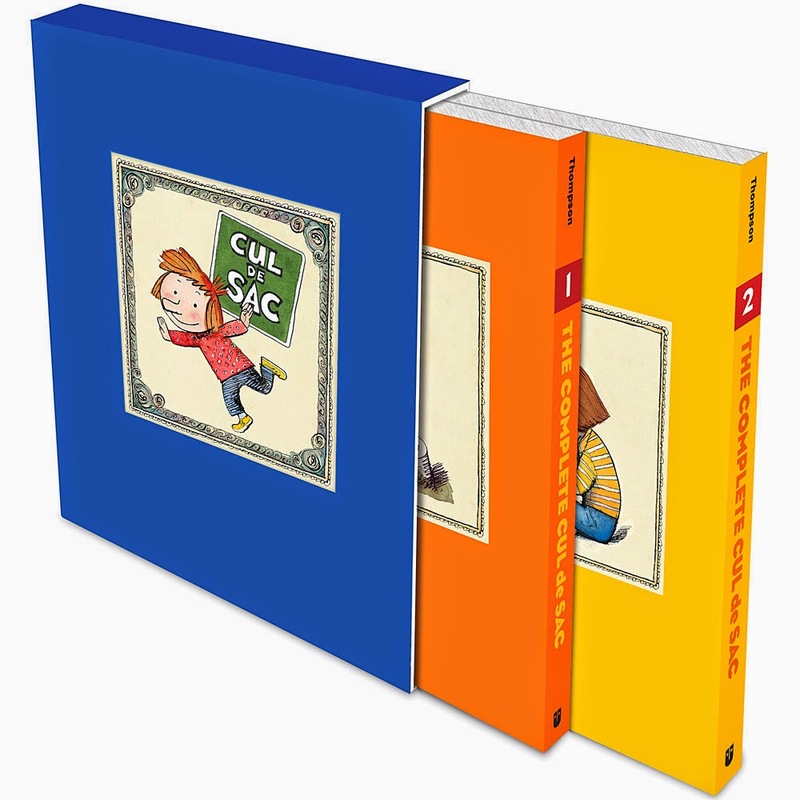 Richard Thompson’s Cul de Sac is one of two comic-strip masterpieces of this century.1 Fortunately for the busy comics-reader, you can now read the entire work in The Complete Cul de Sac (2 volumes, just out from Andrews McMeel). Unfortunately for the medium (of comics! of Art! ), the complete run of the Thompson’s daily strip is a mere five years (2007-2012).2 Parkinson’s Disease forced him to end the strip a couple of years ago. But what a marvelous five years! Thompson’s ability to convey the emotional lives of children is a delight to see. Facing a bewildering and unpredictable world, Thompson’s child characters display a mixture of fierce independence (embodied in his preschooler protagonist, Alice) and insecurity (embodied in her neurotic older brother, Petey). They seek guidance from the fanciful logic of older siblings’ stories, half-remembered truths passed down from their elders, and their own inventive interpretations of reality. As fellow Cul de Sac fan Jeanne Birdsall (author of the delightful and keenly observed tales of the Penderwicks family) puts it, Thompson portrays “children living parallel lives from ours, seeing and hearing all the same things, but experiencing them in a completely different way.”3 Exactly. I especially love the way that the characters — especially the young children — talk past each other. Each is her or his own planet, and sometimes orbital paths bring them closer to each other, but other times they zoom in opposite directions. It’s that ferbile quill pen line — Thompson’s “cartoony grace” — that totally wins me over. It’s hard to master a quill pen! They tend to dribble ink and spatter if you push ’em too hard. They spit up blobs of wet ink or dry up in the middle of a line. Thompson’s mastery seems to be achieved by letting the instrument have its way. They line starts like it’s gonna behave — Mmp — then fattens up where you might not expect it to — MMNG — and then backs up on itself in a breathless skritch of scribbled hatch marks — HEENK! Above: the strip to which Spiegleman is referring. Comics fans will also love the comics jokes! Petey’s favorite strip is Little Neuro, a parody of Winsor McCay’s classic Little Nemo. His Comics Camp teacher is Dan Spinnerack, because — as Thompson points out in his notes — “Comic books are commonly displayed on a spinner rack.” And I swear that Alice’s friend Dill is the great grand-nephew of Happy Hooligan, the protagonist of Frederick Opper’s early-twentieth-century comic strip. My enthusiasm for Cul de Sac is such that I feel a bit like Dorothy Parker trying to write a review of Crockett Johnson’s Barnaby: “I cannot write a review …. I have tried and tried, but it never comes out a book review. It is always a valentine.” So, not that you need more to read, but if you’ve any interest in the narrative art of the comic strip, do yourself a favor and check out Thompson’s Cul de Sac. And then give copies to your friends. Since you asked, I’ll tell you: the other is Patrick McDonnell’s Mutts. And, yes, you may argue with me in the comments, below. It ran for five years as a daily, but there are some Sunday strips that go back for a few years — to February 2004. Jeanne Birdsall, email to author, 28 May 2014. My report for Comic-Con, July 20, 2013. Scroll down to “Team Cul de Sac” to read Lincoln Pierce (Big Nate), Mark Tatulli (Lio), Jenni Holm (Babymouse) and others sing Thompson’s praises. Cul de Sac at Go! Comics. If you’re not convinced by the few strips I’ve posted here, then go to Go! Comics and read more. Calvin and Hobbes is the other masterpiece, but I’m too fanatical to offer an argument. I do enjoy Mutts. I agree that Calvin and Hobbes (1985-1995) is a masterpiece, but it was of the 20th century. My claim applied only to this century (the 21st). Thanks for your response, Craig. I like Mark Tattuli’s Lio. I read it daily — the Kansas City Star carries it. I enjoy its Gorey/Addams sensibilities, too. I don’t think it has quite the range of Cul de Sac. It’s consistently good: I like Lio, his dad, the pet squid, Eva, and all. I like its near-wordlessness, as well. That said, its inventiveness never quite reaches that of Cul de Sac. But I don’t intend that as a slight against Tattuli or his strip because, as I say, it’s very good. Not Cul de Sac genius, but definitely good. The Star has recently begun carrying Wumo, which feels — to me — like an imitation of an imitation of The Far Side. It strives for Larson’s absurdist sensibility, yes. Confess I’m surprised to read your assessment; I find that it nearly always misses. I’ve not read Frazz, though. Thanks for the recommendation! I’ll check it out. Well, to explain my opinion, I DON’T consider the post-Far-Side landscape of single-panel comics to be a vast wasteland – I still love Dan Piraro’s “Bizarro”, even if it’s not what it used to be (don’t let him know I said that; I comment on his blog frequently). And nobody tries harder to copy The Far Side (including character design) more than “The Argyle Sweater”. Yipes. The KC Star used to carry Bizarro, and I liked it — sadly, they’ve stopped carrying it. So, I’d concur that post-Far Side isn’t a vast wasteland. There are good single-panel comics out there. Speaking of single-panel ones I miss (and that the KC Star used to carry), I hope that the Six Chix consortium is still out there somewhere. I especially love Ann Telnaes’ work. I’m turning red from all the accolades ( it could be some form of accolade allergy). Thanks, Phil. All this and pie too? Darn. I knew I shouldn’t have launched those accolades with the Wedekind brothers’ trebuchet! And, seriously, thanks for commenting here. Made my day! I’m so enjoying re-reading all the Cul de Sac strips — as well as reading for the first time some of the early Post strips I’d not seen. So… thank you for Cul de Sac, too! Hope you’re doing OK. Probably named after the imaginative boy in “To Kill a Mockingbird”. He looks remarkably like a giant snow head Calvin built that surprised his father in Calvin and Hobbes.